Visit the Alumni Profiles page to read about some of our past students and to find out what they are doing now. Susan, from Welshpool, graduated with a First Class degree in Accounting and Finance in July 2013. She was awarded the Craig Williams Memorial Award for the best performance in any Bangor Business School undergraduate degree. What made you choose Bangor over any other university? The friendliness and helpfulness of the staff made me finally decide on Bangor University. The accommodation offered by Bangor University was of a higher standard than other universities to which I had applied, and this also played a large part in my decision. What was the best thing about the course? The choice of modules. The core modules relate directly to your degree, but you can also choose from a variety of optional modules: I took some in marketing and management, for example. This flexibility makes the course interesting and gives you time to decide which subject areas you would like to continue exploring. One of the highlights is that the course material of the accounting-related degrees is related to certain accounting professional qualifications, which allows students to claim exemptions for these professional exams if they wish to pursue a career in accounting. All the staff are friendly and approachable. They are always available if you are unsure of anything and are easily contactable through email. I very recently started as a trainee with an accountancy firm in Oswestry where I will train to become a qualified accountant. Participating in seminars and tutorials has given me the confidence I need for employment. 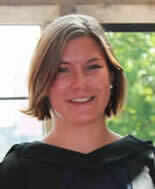 Emma, from Leeds, graduated with a BA in Business Studies and French in July 2013. She was awarded the Bangor Business School Outstanding Achievement Award. Why appealed to you about Bangor? Its beautiful location and sense of community – I come from a small town and didn’t want to move to a huge city. I was also attracted by the university’s reputation and the availability of this particular joint honours programme. Definitely the opportunity to study abroad! I attended both the University of the French West Indies and Guiana in Martinique and Rouen Business School in northern France. It was an amazing experience and allowed me to put my French language skills into practice whilst continuing with my business studies – I was able to study subjects such as Caribbean economics and tourism. I also really enjoyed writing my dissertation on the various causes and consequences of the 2009 strikes in Martinique as it was something in which I was really interested. What’s the best thing about living in Bangor? The close-knit community. Forget six degrees of separation – you will have at least one friend in common with nearly everyone you meet! It’s nice to know that no matter where you go, you’ll always see someone you know. How has studying in Bangor prepared you for employment? The Bangor Employability Award in particular has greatly prepared me for employment. The award involved participating in various workshops and extra-curricular activities as well as completing online assessments which allowed me to reflect on the various skills I had gained and developed. Furthermore, participating in assessed presentations as part of my degree has increased my confidence in presenting to a large audience. Benjamin, from Worcestershire, graduated from Bangor with a First Class degree in Marketing in July 2013. He was awarded the Bangor Business School/Chartered Institute of Marketing prize for the best dissertation in Marketing (pictured right with Professor John Goddard, Deputy Head of Bangor Business School). Why did you choose Bangor? After attending an Open Day, I had no intentions of studying elsewhere. Bangor Business School offered everything I wanted from my degree: flexibility and a diverse selection of modules to develop a balanced understanding of business and marketing. The location is also perfect, and offers great opportunities to pursue whatever sport suits you. I don’t think you could ask for a better backdrop than what you will find at Bangor University. The lecturers are knowledgeable, inspirational and supportive. If you’re having any problems they don’t hesitate to try and help. Even when I approached staff who did not lecture me, they were nothing but helpful and supportive. What has been the highlight of your time at Bangor? 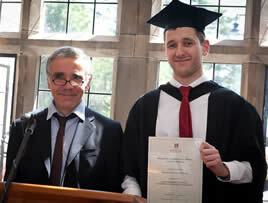 Graduating with a First Class degree and being awarded the Business school prize for the Best Marketing Dissertation. It is staggering to see how far I’ve progressed during my time at Bangor University. It’s a large enough place that there’s plenty to see and do, but small enough that you don’t feel like you’re in a city. Most of the time, you’re only 10–20 minutes away from where you need to be for lectures, so you don’t waste time on public transport. This also meant that I was a short distance from my friends who were living elsewhere. Over the course of my degree I’ve developed an interest in the psychology of consumers, and as such, I now intend to stay in Bangor to pursue a Masters in Consumer Psychology. It’s one of the top places in the country to study this, and I couldn’t see myself at any other university after such a fulfilling undergraduate experience at Bangor. 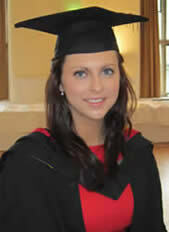 Lucy, from Prestatyn, graduated from Bangor with a BSc in Business Studies in July 2013. 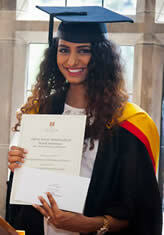 She was awarded the Bangor Business School prize for the best performance in Business, Management or Marketing. She hopes to eventually set up her own business after gaining some essential work experience. I attended an Open Day where the staff and student peer guides were very friendly, helpful and approachable. This made the prospect of starting University seem a lot less scary! Additionally, the modules seemed very interesting and exactly what I was looking to study. Would you recommend your course to others? I would highly recommend the BSc in Business Studies as it is an interesting and diverse course. It enabled me to gain a good understanding of many aspects of business, including accounting, finance, economics, marketing and management. There were also many opportunities for group coursework, which I feel has enhanced my team-working skills – this will be a valuable addition to my CV. What was the highlight of your studies at Bangor? For me, the highlight of the course was being able to meet and interview successful entrepreneurs through the ‘Entrepreneurship, Capital and the Firm’ module. It was fascinating to see what made these business people tick and to learn more about their ventures. It inspired me to look into starting my own business. How do you feel that studying at Bangor Business School has prepared for employment? Many aspects of the modules that I studied have enabled me to improve vital skills such as delivering presentations, working in team situations, writing reports and preparing for and meeting deadlines. 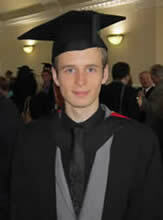 George, from Kidderminster, graduated from Bangor with a First Class degree in Accounting and Finance in July 2013. He was one of three students to be awarded the Bangor Business School prize for the best performance in Accounting and Finance. Why did you choose Bangor for your studies? Ultimately I chose Bangor Business School for the high quality degree course it offered. The friendly people and the wonderful scenery surrounding the University also helped to tip the balance towards Bangor. Being able to learn and develop new skills whilst being supported by knowledgeable and supportive staff. The degree in Accounting and Finance offers a wide scope of optional modules – I took modules in marketing, management, and economics, for example, which made it easier to understand the wider business environment. I now plan to continue studying to become a chartered accountant. My time at Bangor has given me the not only the confidence and the knowledge to study for these qualifications, but also some important exemptions from the professional examinations which will allow me to become chartered and qualified more quickly. The degree at Bangor has really set me up for moving onwards in the accounting world. The final year: not only were the modules more specialised and interesting, but to graduate with a First Class degree after all the hard work was the icing on the cake. The best thing about living in Bangor is the people – everyone is really friendly, which makes it an easy place to settle in to. Meeting new and friendly people made Bangor feel like a home from home. Sherry, from Bahrain, graduated with a degree in Banking and Finance in July 2013. She was the joint winner for the School prize for the best performance in Banking and Finance. I’d heard about Bangor through the Bahrain Institute for Banking and Finance, which has a partnership with Bangor University. I was attracted to Bangor by its academic reputation, particularly in the fields of banking and finance. I also felt that the university offered just the right location in which to be a student. The University is well equipped in terms of learning resources. The teaching staff are very co-operative and friendly – you could approach any member of staff with confidence that you would receive the help you need. How has studying at Bangor prepared you for the future? Studying at Bangor has helped me become more independent and confident about myself. I know that I’ll be able to handle any situation that comes my way. Choosing Bangor is the best decision I have ever made – I don’t believe I have been able to achieve so much at any other university. I intend to gain around two years’ worth of practical experience before pursuing a Masters degree. Why did you choose to study at Bangor? Originally, because of the fantastic location – the scenery is stunning and there is so much opportunity to enjoy the countryside. Snowdonia National Park is half an hour’s drive away, and the area offers some of the best surf, sailing, and paddle sport locations in the UK, all which can be done through the Students’ Union. I like the fact that we are encouraged to read around the subject. I came to university to learn and to research things for myself, not to be spoon-fed information. The lecturers at Bangor give me the right amount of information and space to be able to carry out my studies effectively. The School’s support structure is brilliant. My personal tutor has been very helpful and she has always been there whenever I have needed her. Tell us about your experience on the university’s Undergraduate Internship Scheme – what did it involve, and how has it benefitted you? I obtained a placement as Project Support Officer at the Institute for Competition and Procurement Studies, located within Bangor Law School. It is the best internship anyone could possibly have: I was given meaningful and, at times, demanding tasks (I was never once asked to make tea! ), and I was paid a decent wage. I was given the responsibility of managing all the nominations for the Inaugural Welsh Procurement Awards, acquiring sponsors for the Awards, and writing the speeches. I was also thrilled and proud to be given the opportunity to write the speech for a video Jane Hutt (Finance Minister and Leader of the House, Welsh Assembly) gave to all nominees, winners, and participants of the Procurement Awards. I feel I have benefitted greatly from this opportunity and it really shows that Bangor University has a firm commitment to enabling its students to enter the workforce skilled, ready, and competent, placing a high value on employability. This internship has been the highlight of my university experience so far – I cannot think of a better internship to have had. 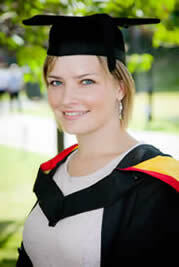 Ceri, from Anglesey, graduated with a First Class honours in Accounting and Finance in July 2012. She was awarded the Bangor Business School prize for the best performance in Accounting and Finance as well as the Craig Williams Memorial Award for the best performance in any Bangor Business School degree. With it being so close to home and the Business School having such a fantastic reputation, I always knew that I would apply to Bangor. When I was lucky enough to be awarded two scholarships [the J.H.Gee and the Bangor Merit] to study here, I decided to attend an Open Day. From that day, I knew that I didn’t want to study anywhere else. The atmosphere was great, the lecturers and peer guides were all extremely welcoming and friendly, and I was given a detailed presentation of all the courses and what they had to offer. What were the best things about studying at the School? As a student of Accounting and Finance, it was great to be able to qualify for certain ACCA exemptions – very valuable if you’re considering a career in accounting. I also had the freedom to choose between the BA and BSc routes, meaning I could alter my degree to suit my personal skills and needs. As I preferred a more mathematical approach, I chose the BSc route. With Welsh being my first language, I valued the opportunity to study certain modules through the medium of Welsh. Naturally, the class sizes were much smaller, which meant that there was more interaction during lectures and this helped me gain a better understanding of the topics. All the School staff have been fantastic and I cannot fault the help and support on offer. My personal tutor and all my lecturers were always happy to help, and whether it was face-to-face or via email, they never failed to resolve any problems or queries. Graduating with a First Class degree – it demonstrated how far I’d come with my studies and proved that all the hard work was worth it. Being awarded the School prizes for the Best Performance in Accounting and Finance and the Best Performance in Any Business School Degree was an amazing added bonus to my academic achievement. It goes to show that anyone is capable if they have the drive and determination to succeed. Not only is Bangor a beautiful place, but it’s a much smaller city compared with many other university locations. It’s big enough for a good night out with friends, but not quite as big as other cities, which means you feel safe with a close sense of community. You’re always sure to bump into someone you know in Bangor! I will definitely miss seeing all the great friends that I’ve made here over the three years on a daily basis. 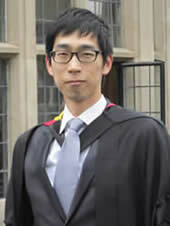 Han, from South Korea, graduated with a First Class degree in Accounting and Economics in July 2012. 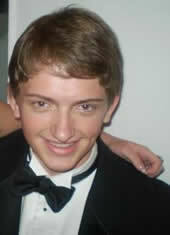 In September 2012 he will undertake a Masters degree at the London School of Economics. I was already studying Business Administration and Economics at a Korean university that has a partnership with Bangor University. I completed a year in Bangor as an exchange student, and enjoyed it so much that I decided to transfer here. The course is very well-organised. Although there are mandatory modules, students can choose several optional modules according to their own interests. Successful completion of certain modules leads to exemptions from some parts of professional qualifications, such as ACCA exams. I particularly enjoyed the Quantitative Methods modules as they really helped me to understand finance. What will you miss most about Bangor when you leave? The School’s supportive staff! I’m particularly appreciative of John Goddard, the Deputy Head, and Deborah Garlick from ELCOS, who helped me to improve my English skills. As a result of this attention and support I achieved a First Class degree, which is unbelievable to me still. Of course, there are a number of other things that I will miss, such as Bangor Pier, Roman Camp, and the Menai Bridge. I will never forget time spent studying with my friends in the Welsh reading room at Main Library. Bangor is a very student-friendly place: not only it is safe and affordable, but it also has splendid views. Students at Bangor have the opportunity to meet a variety of people from all over the world, and to exchange cultures and knowledge. After completing an MSc in Accounting and Finance at the London School of Economics, I will be looking for a financial sector job in Asia. Specifically, I want to be an analyst or trader in the debt or security markets. I have no doubt that studying at Bangor Business School has given me all I need to develop my future career, and through the opportunities that Bangor has given me, I have the ability to reach my full potential. 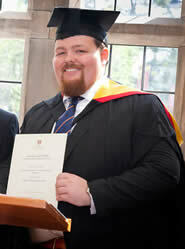 Andrew, from Welshpool, graduated with a First Class degree in Business Studies in July 2012. He plans to set up his own business after graduating. I chose Bangor University because of its setting and location – I live in the Welsh hills, and therefore wanted to study somewhere that was a beautiful as home. Bangor is only a two hour drive from home, meaning it is easy enough to get home, but also far enough away that I had my own independence. The Business Studies programme was exactly the course I wanted to do, so Bangor suited me perfectly. It is a large enough place to have the main high street shops and enough places to go on a night out while not being too big and congested. One of the things I will miss most is seeing the great friends that I have made here on a daily basis. The large variety and choice of modules we had. Some courses only offer 6 modules a year, whereas we studied 10 or 11 modules, meaning we were exposed to a much wider range of subject areas. We also had the option of taking Law and Chinese business modules, which were great fun. The sheer variety of modules allowed me to choose modules that I enjoyed and at which I excelled. I had some excellent lecturers, who made learning much more enjoyable and the lectures easy to follow. Any prospective student would only need to sit in a lecture with someone like David James or Sara Parry and that would be enough to tell them the course is worth doing! Studying for my degree has given me lots of knowledge and the confidence needed to realise my ambition, which is to start up my own business. I have learned a lot of new material on the subjects that I studied, as well as presentation skills, and I hope to be able to apply these in the real world. 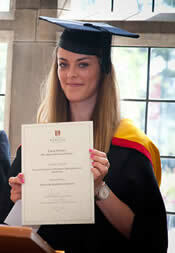 Gaenor, from Flintshire, graduated with a First Class degree in Business Studies in July 2012. 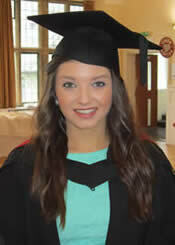 She was also awarded the Bangor Business School prize for the best performance in Business, Management or Marketing. I took a year out after my A Levels as I was unsure of the career I wanted to pursue. During this time I came to stay with a friend who was studying at Bangor and I had an amazing time. I knew then that whichever course I chose to study, it would be at Bangor University that I would do so! I attended an open day at the Business School where we were welcomed by friendly and helpful peer guides and lecturers. The day reassured me that the course was going to be interesting and diverse and that there would be plenty of support available throughout the course, and having now completed my degree, I can say I haven’t been disappointed. I chose the Business Studies degree as it meant that when I graduated I would have the option of entering a wide variety of functions, which I feel is a huge advantage. The course was very broad and therefore allowed me to develop a knowledge and understanding of several aspects of business, from marketing and finance to governance and regulation. The wide variety of modules includes some that involve field trips – a welcome break from the lecture theatre! My experiences have all been positive. The lecturers are supportive and helpful as well as very knowledgeable about their subjects. They clearly want the students to achieve the best results. One of the biggest advantages about studying at Bangor Business School is the option to change courses at the end of the first year. This is possible because everyone studies the same core modules during the first year. I began my time at Bangor on the BSc in Finance, but having realised by the end of first year that Maths was not for me, I was very glad to have the opportunity to change programmes without re-sitting a year. As a Welsh Speaker, I have to add that I was extremely pleased to have the opportunity to study some modules through the medium of Welsh. My Welsh lectures were some of my favourite because as the class sizes were dramatically smaller than the English equivalent, enabling me to develop a much greater understanding of the subjects than I would otherwise, as there was much more interaction between the lecturer and students during class. Have you been on any placements? In the second year of my studies, I chose the ‘Work Placement’ Module which required students to complete a 2 week work placement in an organisation of their choice. I undertook a placement in the Human Resources department of the Welsh Ambulance Service NHS Trust. During the placement I attended and scored candidates at interview, attended sickness reviews and met with executives. I found the experience hugely valuable as I was able to gain experience within my field of interest. Bangor is small but this has its advantages – you always see all your friends out which always makes for a good night out. It’s a beautiful place which means in the summer you can enjoy all the lovely beaches and the scenery – something most other universities can’t compete with. The best decision I made was to join a sports club and I would very much encourage anyone studying at Bangor to do the same. It totally changed my university experience and made it even better. You meet lots of new people and have nights out that you will never forget. “The BSc in Accounting and Finance was recommended to me by a friend who is a graduate of Bangor Business School. I was attracted by the School’s first-class reputation, as well as the convenient structure of the course, which would allow me to fit my studies around my existing work. My course placed a great emphasis on reconciling theory with practical real-world concerns – something which is facilitated by the fact that the academic staff are respected industry experts and still very much involved in things like policy making. Recent developments within the present economic environment require new graduates to possess a good grasp of business ethics, and the direction of the courses at Bangor Business School ensures that all its graduates are trained to meet this demand. For me, the highlight of my time at Bangor was the interest that the staff took in the progress of their students, and the inspiration that they bestowed in me as an individual. Their positive reaction to my work has given me great confidence – so much so that I have decided to remain at Bangor and to pursue a Masters. “My main reason for deciding to come to Bangor was its superior faculty and facilities. Bangor Business School provides an excellent environment in which to study Banking and Finance. The lectures gave me the skills to put theoretical knowledge into practice, and to think critically about the topics introduced in my studies. I feel confident that the skills and abilities learnt during my time at Bangor will prove invaluable in the rest of my academic life and in my future career. Winning the ‘Best Performance in Economics’ prize during my graduation ceremony was a definite highlight and proves just how far I came in my studies. Banking and Finance is not only about finance and economics – it also focuses on quantitative techniques. A definite advantage to this course was that I gained a systematic knowledge of mathematics, which in turn has laid a solid foundation for me to develop a more thorough understanding of financial knowledge. 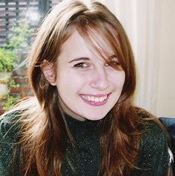 I am currently undertaking a postgraduate degree at Cambridge University, after which I hope to go on to do a PhD. Sometime in the future I aim to become a lecturer and perhaps even return to Bangor Business School! “I applied to Bangor having heard about its good reputation and that Bangor is a beautiful and peaceful place in which to study. 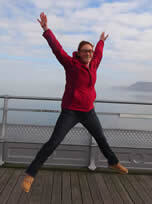 “I first came to Bangor as an Erasmus exchange student. I enjoyed the experience so much that I decided to return to pursue my Masters degree in Accounting and Finance. The low cost of living in Bangor and the Business School’s reputation as the No.1 for research in the UK convinced me that this was definitely the right decision. I particularly enjoyed the structure of the course, the classes and the friendly and helpful atmosphere of the School. The small class sizes meant that it was easy to get in touch with lecturers and to ask for help – whatever problem you may face as a student, you are guaranteed to find someone to help you at Bangor. “I was attracted to Bangor Business School by its reputation and research excellence. I found that the well-experienced tutors guide and encourage students to think independently and critically – this, I think, is the most important thing I have taken from my time at Bangor. The MSc in Accounting and Finance is taught in such a way as to enable students to gain a theoretical knowledge that they will be able to apply in a practical working environment. Various types of group work offer a great opportunity for students to cultivate interpersonal skills which, alongside the theoretical and professional knowledge, will be essential in any future career. “The MBA in Banking and Law immediately appealed to me when I was researching postgraduate course online – it seemed the perfect course for me. It was an added bonus to find that the cost of living in Wales is lower than in many other parts of the UK. The course deals with the traditional academic aspects of banking as well as contemporary practical issues, and takes a close look at the legal aspects of financial markets. Throughout, the lecturers have made the topic interesting and have been helpful, approachable and responsive. The non-academic staff have also been very accommodating. “I chose Bangor Business School for its broad range of specialist topics – this means more choice for anyone who wants to pursue academic research. I’d also heard good things about the School’s facilities and the level of help offered by the research supervisors. During my time at Bangor I had the opportunity to undertake a work placement with an investment firm in London. This really helped me to understand and engage with my research subject and also to see how my academic work could be put into practice. Having already spent three fantastic years in Bangor, it wasn’t a hard decision to stay on. It’s got everything that you could need as a student: a society for everything you could possibly hope for, enough of a selection of night life with plenty of pubs, and within throwing distance of some of the most stunning scenery and mountains. It’s big enough to lose yourself if you want to, but small enough that just by popping down the high street you’re bound to see someone that you know – for me it is a home from home! The MBA is a fantastic chance for me – not only is it carrying on and expanding with the environmental side that I learnt in my undergraduate degree, putting my knowledge into a more realistic context, but it is also teaching me about how businesses function on both a human and financial side which will be vital after university. How has this differed from the undergraduate experience? There is a notable increase in work load, which is only to be expected. So long as you pace yourself it is manageable and you do acclimatise to it. I’ve found that the best way to tackle the course is to treat it as a job, as otherwise I would spend my entire time with my head in a text book! Joining a club or society is a good idea as it balances out the work ratio. What has been the highlight so far? Without a doubt it has to be the people. Everyone is so down to earth and friendly that it doesn’t matter what you end up doing – making a trip to the beach, cooking at someone’s house, climbing a mountain – you’ll find someone to come along with you. Having lived in Bangor my whole life and completed my undergraduate degree here, the next step was a Masters. One of the lecturers mentioned the MBA in Environmental Management and it got me thinking. Having been at Bangor’s School of Environment, Natural Resources and Geography for three years, a collaboration with the Business School felt rather daunting at first. However, it is one of the best decisions I have ever made. The course has put many things into perspective and I have learnt so much in such a short space of time that I know I will benefit from in the future. The course is like having the best of both worlds as you are able to access two knowledge-pools, both of which have expertise in all types of fields. Bangor is the ideal place to study with the variety and range of environments on your doorstep. This is not only a bonus in terms of studying and research but there is always something to do! Student life is very affordable and there is always something to do with a range of pubs, shows, mountains and beaches all within a short travelling distance. Bangor offers so many societies to get involved in and the University organises a range of different events, such as the International World Day and Bangor variety shows. University is the place to make friends and learn about different cultures and traditions from others, so make the most of the opportunities.